Pregnancy can be a new and uncertain time for many expectant mothers. During this time, they have to be far more careful in regards to their diet because they are now not only eating for themselves, but for their developing baby as well. There are many safe types of drinks and foods that are recommended for pregnant mothers. 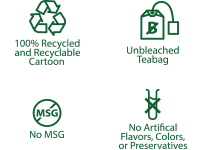 Among these recommendations, rosehips tea is also highly recommended due to the healthy, positive benefits it has to offer women that are pregnant. When a woman is pregnant, it can be a far more difficult task to absorb the amount of vitamins and minerals necessary to keep both the mother and the child healthy. The natural defense of the body may also be lowered easier, making it even more important to take in as many vitamins and minerals as possible in order to protect the body from unwanted infection and disease. One of the most essential vitamins during pregnancy is vitamin C. This is because vitamin C is mandatory in order to produce collagen (fibrous proteins) for both the mother and the baby. Collagen is important, because it’s what structures the bones, cartilage, and muscles. Vitamin C also helps greatly in the repairing of tissues and wounds in both the mother and the infant as well. Furthermore, it is also useful in assisting other nutrients with their functions. Other uses that can be derived from this essential vitamin are its ability to increase the absorption of iron in the body and the capability to convert folic acid into its active form. Making sure you take in a proper amount of vitamin C can help ensure that your baby is born a proper wait. Other essential vitamins and minerals needed during this crucial time of a woman’s life are iron and vitamin A among others. The iron is particularly necessary because it is responsible for producing hemoglobin in the body which in turn assists by carrying along oxygen through the cells in the circulation of the blood. Iron deficiencies are common during pregnancy due to the increased need for blood so that makes it more required than usual. Vitamin A holds an important role in the development of the baby as well, assisting in various growth in the embryo such as bone and skin growth. There are many supplements and teas that are recommended for women to help ensure that they get all the needed nutrients and minerals needed in their body. In the case of Rosehips tea, it can help by offering the mother and her baby a good amount of these needed substances. 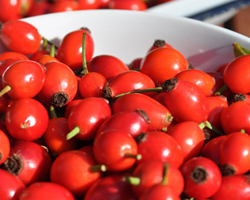 In the case of vitamin C, rosehips tea holds a higher concentration of this vitamin than any citrus fruit can offer. Since the intake of vitamin C also encourages the absorption of iron in the body, it makes it even more of a valuable drink for women that are pregnant. Rosehips tea is gentle and safe, but women that are pregnant should consult with a doctor prior to taking it because the individual amount needed for every woman is different. 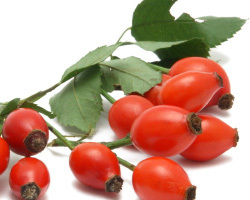 Drinking rosehips will also help to boost a mother’s immunity, making her less susceptible to colds and other illnesses. Since rosehips tea is a tasteful, comforting drink that has been deemed safe and healthy for pregnant women so it isn’t any wonder then, why so many recommend it. 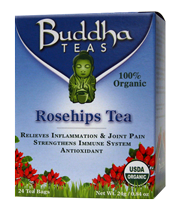 Rosehips tea is full of many benefits to be taken advantage of. However there are occasionally some effects that should be taken into consideration.